Long ago when titans walked the earth and great beasts ruled the wild places, there was Pohjola, a land ruled by a great chief of the same name. To him was born 3 daughters,and to each of his daughters he entrusted something sacred, so that they may protect Pohjola in their own fashion according to their own temperament. But a Twist of fate and the great avarice and trickery of the bog hag, follower of Louhi, trapped the sisters three in a pendant of pearls. There they wait, frozen in ever-summer with the blush of youth destined to repeat the tale of the old songs until a champion navigates the pearls and frees them. Do you have what it takes to finish the old song once and for all? This module includes 20 adventure-packed pages, complete with locations and maps, forming a ready-made adventure. It has been crafted for one player and one GM so even the smallest gaming group has adventures suitable to their needs with minimal preparation time. 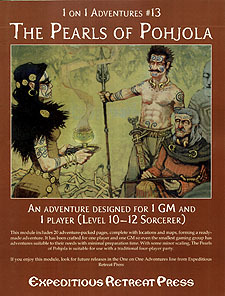 With some minor scaling, The Pearls of Pohjola is suitable for use with a traditional four-player party.